You want to establish the Soil Food Web in the soil. To do so, you need to give them a friendly living environment. When you allow grass to be grazed too low, you are compromising the root system. For a deep root system, it is best not to graze grass too short. Rotational grazing, and moving cows frequently, can help to solve this issue. "Sadly, in most of our agricultural soils, we have far more bacteria than fungi. High density short duration grazing accompanied by appropriate rest periods, are moving soils toward fungal dominance." "Fungi are important for soil carbon sequestration as well as nutrient acquisition." Fungi are necessary for forming humus. Growing a blend of plants together helps to diversify the types of microbes in the soil. Diversification of pasture plants has become a very beneficial movement among graziers. 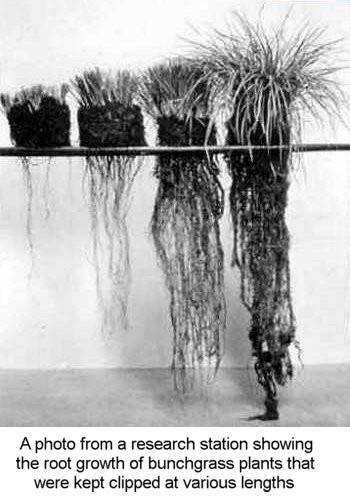 Some plants have deep root systems, which will help to take liquid carbon and soil structuring to new depths. Herbicides, fungicides and insecticides are killers that disrupt soil biology. Chemical fertilizers are insoluble. Since they are immediately available to the plant, the plant has no need to sequester carbon into the soil. These don't need soil life, and don't feed soil life, meaning that the soil slowly dies. All soil life, and especially fungi, are taken into disarray when the soil is tilled. Carbon sequestration is quite dependent on mycorrhizal fungi, so every disturbance to the soil that disrupts mycorrhizal networks diminishes carbon sequestration. Aggregates do not form in bare soil. It tends to break them down. This then limits the amount of organic nitrogen available to the plant, and hinders microbial growth. Bare soil will be hotter and lose more moisture than covered soil. Some think that cover crops will use up moisture, but the opposite is usually true. They help to conserve moisture. If the soil has been cultivated or bare fallowed, mycorrhizal fungi will not be there in sufficient quantities for effective carbon flow and nutrient acquisition. GPB helps to devour toxins and remediate salts. It helps to restore balance to the soil, including pH. It inoculates the soil with 70+ aerobic bacteria, mycorrhizal and other fungi, as well as other beneficial microbes. It feeds these microbes and helps them get established in the soil. It helps to raise the energy (ergs) in the soil. It helps to establish wonderful networks of mycorrhizal fungi. GroPal Balance is the foundation upon which the other keys need to be laid. It establishes the conditions in the soil needed for maximum carbon sequestration. Buy GroPal Balance A now!